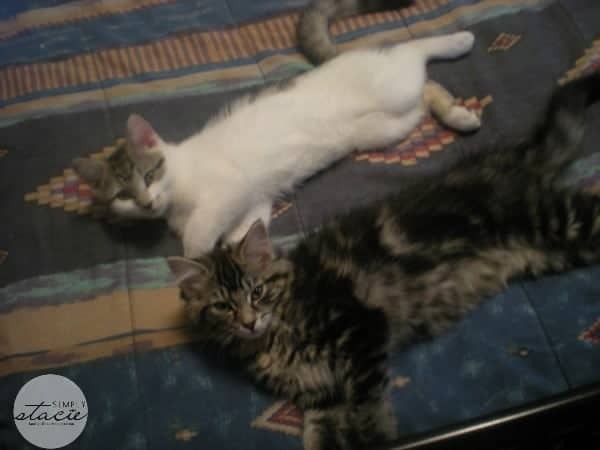 In 2010, John and I adopted two beautiful kittens. I named my cat, Princess and John named his Mystique (Misty for short). They were litter-mates and inseparable so they came as a package deal. I didn’t mind though because I love cats! Though my cats are sisters, they have very different personalities. Princess is the “in your face” type and always wants to be petted. She’s sassy, daring and bold sometimes! Misty, on the other hand, is quiet and very gentle. She’s the only one who licks and for some reason loves to lick John’s arms and legs; she isn’t that interested in mine though. They were always around the same weight and size up until a few months ago. Last year, we had both cats spayed and since then they have put on some weight. Misty is still a normal sized cat, but Princess has really beefed up. My kids think it’s funny how big she is now compared to her sister. I wouldn’t say she’s obese, but she is a little overweight. When she runs her belly shakes and jiggles from side to side. She’s also getting older so spends a lot of her time resting. I think she may be a bit on the lazy side! She enjoys her beauty sleep. I learned that it was normal for a cat to put on some weight after spaying as it slows down their metabolism. The last time Princess saw the vet she suggested I switch her food to a premium quality cat food. She told me it would help her with her weight and also her overall health. I notice the vet always asks me the brand of cat food my cats eat on every visit. It’s an important factor in keeping a healthy cat! I was recently introduced to a brand of pet food called Petcurean. They are a family-owned Canadian company that makes both dog and cat food with the same love and care that goes into preparing a meal for family. On their website, they illustrate the Petcurean Difference and explain in detail about the difference between Petcurean Pet Food and the economy brands on the market. I learned that not all pet food is created equal and in fact, there’s a huge difference between the cat food I was feeding Princess and Misty and the Petcurean cat food they are currently eating. I really had no idea! I guess you learn something knew every day and at least now, I can make an informed choice when I select food for my cats. I’ll briefly summarize here what I learned about the Petcurean difference. You can read all the info on their site if you want more in-depth information. 1. Unique Recipes: Petcurean uses only high-quality ingredients like market-fresh meats, veggies, fruits and berries. I think it’s also important to note that they don’t use any artificial preservatives, growth hormones or by-products. I don’t want to fill my body up with extra junk so it makes sense to not want my cats to eat food full of fillers either. 2. Nutrient Richness: Petcurean pet food is full of high quality ingredients and nutrients so your pet will need to eat less food than if they were still eating an economy brand! I learned that pets need to eat more of a lower quality pet food to get the same amount of nutrients as they would eating Petcurean pet food. What this means is you won’t have to buy as much pet food as before. 3. Quality: You won’t find any un-named meats or by-product meats in Petcurean Pet Food. All the meat used is top quality, “named” meat like chicken meal and salmon meal which are high in protein and more nutrient-dense than regular meat. This ties into #2 where you can pack more nutrients into a lesser amount of food. Their dry food is all manufactured in Ontario and canned food is made in Ontario and a secondary plant in New Jersey. They also note on their site that they are 100% China Free. 4. Pet Food and Only Pet Food: Petcurean’s only goal is to create unique, flavourful and nutritious pet food to keep your cat and dog happy and healthy. They aren’t planning to branch out into other niches and I like that they are strictly focused on only producing quality pet food and nothing else! 5. Only in Pet Specialty Stores: You will not find Petcurean pet food at your local grocery store or mass retailer. You’ll be able to buy the food at pet specialty retailers as they are also passionate about the well-being of animals. I found the Petcurean brand at our local Pet Valu in the mall. The Where to Buy locator will help you find the closest store near you. Before I headed out to the pet store to pick up some Petcurean cat food, I used the Food Selector found on their website to pick the right food for my cats. The recommendation was GO! FIT + FREE Grain Free Chicken, Turkey + Duck Recipe. 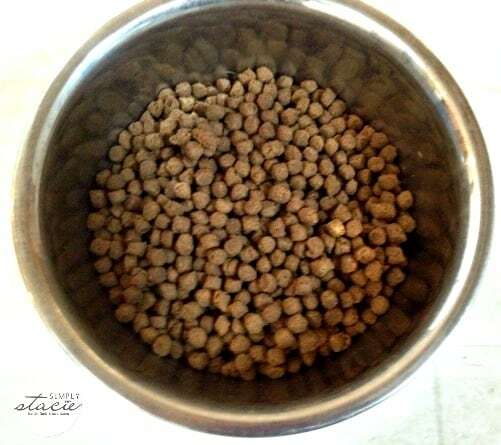 It’s a lower carb recipe that’s protein rich that seemed like it would be perfect for Princess as she aims to shed a few pounds. It comes as both canned and dry food. I picked up an 8lb bag of the dry food since that’s what my cats are used to eating. The FIT + FREE™ recipes have the most meat of any of the GO! recipes and also has veggies, fruits, berries and omega oils. It’s best to introduce a new food slowly by gradually adding a little bit of the new food to the old food each day for a 10 day to 2 week transition period. This will allow the cat to adjust to the new food. Princess and Misty were fine with the new food though and didn’t need as long of a transition period. I wasn’t sure what they would think of it because they are very picky eaters. In the past, they’ve even turned away from some brands of cat treats! They definitely have their likes and dislikes. I figured it was worth a shot and I wanted them to get on a healthier diet. Hopefully Princess will slim down and be able to maintain a healthy weight. I shot a video of the first time both cats tried the new food. As you can see Princess is more dominant and digs right in leaving Misty to wait her turn. 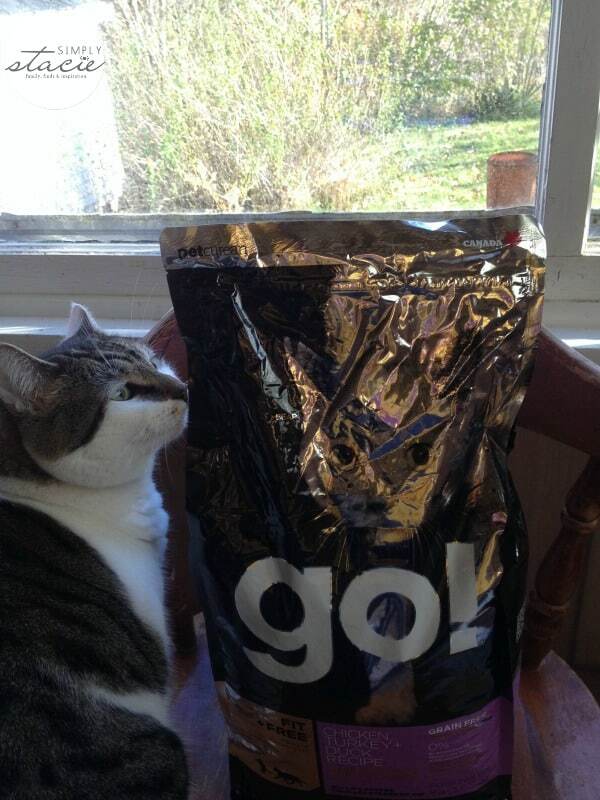 Both cats are now loving the GO! FIT + FREE Grain Free Chicken, Turkey + Duck Recipe and run to the bowl when I add their food each day. As I mentioned that one of the Petcurean Differences is that your pet will eat less of the food because it’s more nutrient rich. I did notice that with their dish. I don’t put as much food in as a I used to and they don’t seem to be consuming as much as they did with the economy brand cat food I previously purchased. That’s fine with me because their supply will last longer and I won’t have to buy cat food as often as I usually do. In terms of weight loss, it’s too soon to tell. Princess looks around the same size, but she’s only been eating the food for about 2 weeks. Healthy weight loss is a slow process. I figure by her next vet’s appointment they’ll be able to see some changes on the scale. That’s the plan anyways! I was lucky to have the chance to interview Michele Dixon, Petcurean’s Pet Nutritionist, and ask her a few questions about cats and losing weight. I found all her advice very helpful and informative! 1. What is a healthy weight for cats? You shouldn’t be able to see their ribs or their backbone but you should be able to feel them pretty easily. So if you can’t feel your cat’s ribs or you can’t feel their backbone, they may be obese. Cats, likes people however, should be treated as individuals, and as such the use of body scoring condition is the best way to determine if your cat is a healthy weight. Here is a chart http://vet.osu.edu/vmc/body-condition-scoring-chart As well, if you have an accurate scale you may use that as well. Take the cat in your arms, and stand on the scale. Next weigh just yourself, and subtract the difference! 2. What is the best food to feed an overweight cat and why? Canned foods that are low carb are the best option to feed an overweight cats. The impact of water content on energy density and food consumption may help promote weight loss in cats, as well as help the carnivore with metabolic processes or losing weight. A good example of a low carb canned diet is the GO! Fit + Free Chicken, Turkey + Duck Recipe. 3. How much food should my cat eat per day? Cats should be fed according to weight and activity level. The use of feeding guidelines is a great place to start, and you would simply increase or decrease based on body score condition. 4. How fast will my cat lose weight? Rapid weight loss is not desired, rather a slow gradual decrease in weight. Every cat is different in terms of how they metabolize food and their caloric needs, so a good starting point is to reduce the calories by 20%, and weigh the cat every 3-4 days to see if there is a shift. 5. 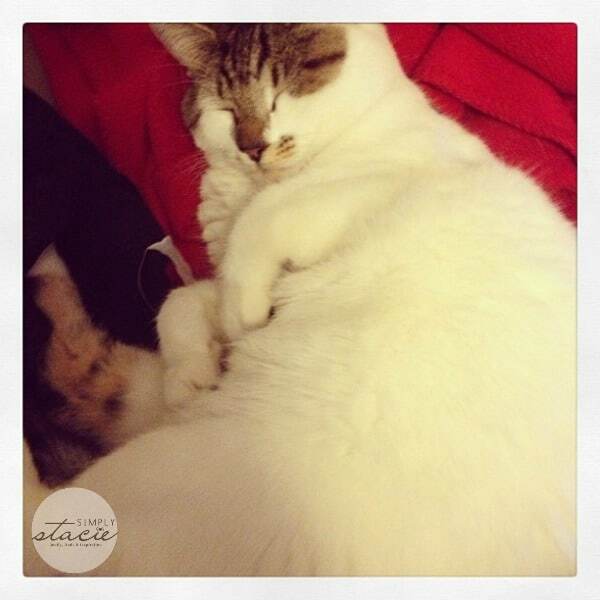 Do you have any tips for multiple cat households where one cat is overweight and the other one is average size? Is it ok for my average sized cat to eat the same food as the overweight one? Often times the best remedy is to feed all of the cats the same diets, but this depends on owner compliance. A reduction in the amount of calories the cat is eating is required, so a solution needs to be devised where the all cats are getting the required calories to maintain the correct weight. The Body Condition Scoring Chart that Michele mentions is pretty neat! Take a peek at it and see where you cat fits. Princess is definitely Stout while Misty is Moderate. I notice Misty looks almost the same size as Princess, but that’s because she is so fluffy! She’s not that big when you pet her. I’m looking forward to continue feeding my cats Petucurean’s cat food and seeing all the positive changes in their health. I remind myself of the saying, “You are what you eat”. That goes for humans, so why not animals too? 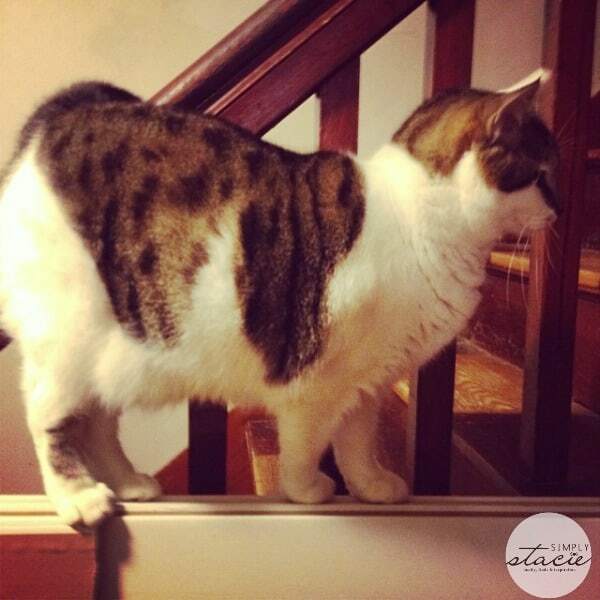 Have you ever had an overweight cat or dog? Oh my gosh, both of your cats are so cute! I have a cat, too. I usually just buy her food at the grocery store, but I may have to try this brand out. aww how sweet are they!! My dog is over weight and he’s a little chihuahua.. we don’t even feed him table foods, he’s just not as active as he use to be. Your cats are cute! We have two too and one is quite overweight. We are working hard on getting her weight down but so far nothing has worked. We just switched her food but if it doesn’t work I might give Petcurean a try. The cat we had for over 21 years was over weight for a good portion of his life. He was so fat that we could hear him walking on carpet, I kid you not. I hope you’re successful with having your cute cat lose some weight. Your kitties are super cute! Excessive weight causes the same problems in pets as it does in humans. Petcurean sounds like the solution to cat obesity. Great review as always, Stacie! 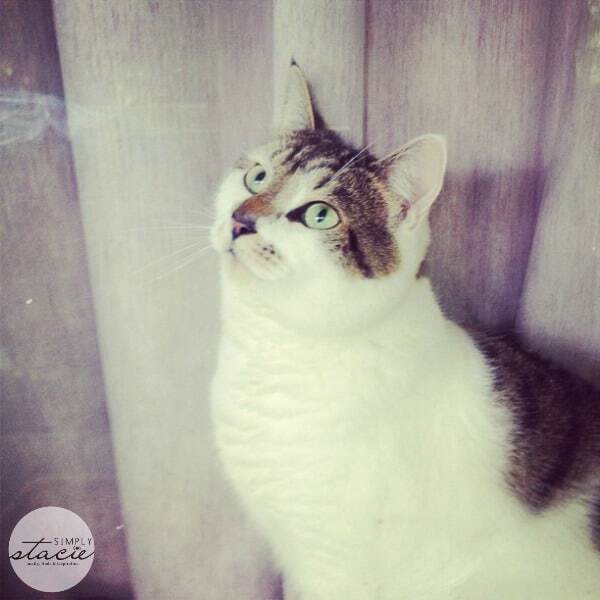 Your cats are adorable.I’m a cat lover too and adopted a cat called Lucy.She is also fat and lazy and so sweet and funny.Good luck with the weight loss. what cuties! passing this along to my bestfriend who has a chunky cat herself. Cute! And you’re doing a good thing! Time for me to buy some of that cat food. I have 7 cats, but only several are really overweight. THe 2 females do not look related, one is small, but the calico cat is bulging on the sides. Time for her to lose weight. What adorable cats, loved the video. My daughter had a problem with her dog, a small breed, that was constantly being sick and having diarrhoea. The vet put the problem down to the food, a change of diet (to a more expensive brand) did the trick and cured the dog. So the feed you give your pets plays a very important part in keeping them healthy. I have had an overweight dog, and I stopped giving him scraps of human food, and took him walking and bought him better food. He lost a lot of weight! 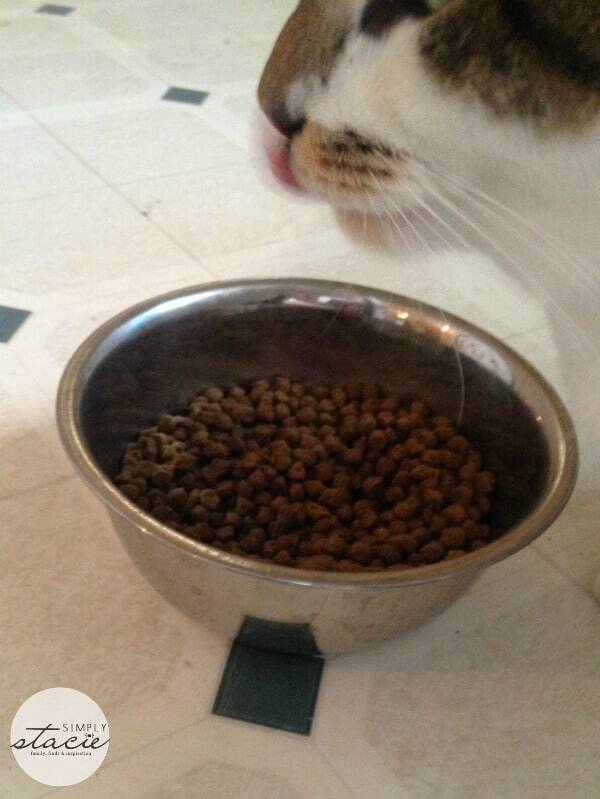 But I think your cats are adorable, and it makes so much sense to give high quality cat or dog food to our pets. This will give them a longer life. I hope your cat loses weight. I once had two cats that came from the same litter, and it made their differences in personality so much more fun, knowing they were ‘siblings.’ This sounds like an excellent pet food. I noticed a person who had an older dog, who kept a good weight, how little the dog could be allowed to eat – it was so little, yet anything more, and he would become overweight, all the more important to make sure the pet’s diet is very, very healthy, as there aren’t extra calories to waste when they can’t eat much. Definitely some cute cats you got there. And how wonderful that you are taking care to help with the weight loss. I don’t have any animals as allergic but I love seeing when others take such good care of their animals when so many get cats, especially, and then they spend all their time outside, whining to get in and fed. Good on you! It is important to read labels and pay attention when choosing your animals food. Good post and comments. I didn’t realize that typically canned low carb food is best. We really do tend to spoil our pets sometimes. Not to make light of a serious topic, but I like to say they are happy and well-fed. Obviously they can’t obese or in bad shape, but I do let mine be on the plumper end of average. I make sure they are active and limit human food. You have a couple adorable, well-loved fur babies. I LOVE Princess and Misty. A post full of their pics is fabulous! I also had NO idea that Misty’s full name was Mystique! I am so seriously glad to hear how much they are loving their new food! 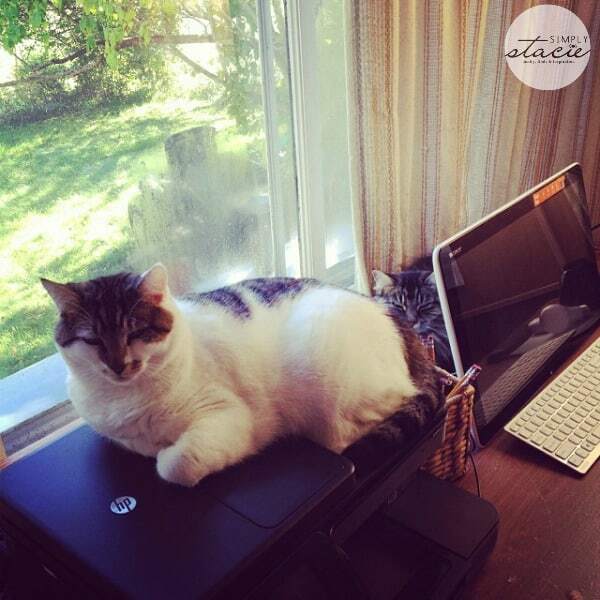 Great post Stacie! I am so very happy that you wrote of this problem and solutions to overcome it.Many people believe that because they love their pets that giving tidbits and food from their plate is showing how much they care.The exact opposite.Food not designed for a cat will cause severe dental problems and fatty liver disease,just to name two of the more serious that will cause the poor thing serious pain and reduce its life span. Beautiful kitties for sure! We have the opposite problem as our doggie is underweight a tad. I love the GO! food for him too, and he’s already gaining a bit. It’s hard when he’s so active. You’ll see the weight loss soon, but it’s good you’re doing it slowly – that’s so key! Your kitties are so cute! I have three cats, too, and they are still young and so this was a good post for me to read to know ahead of time before they get overweight. Your cat “Princess” and my cat “Lucy” look like they could be sisters.Lucy was also adopted at the pound.She’s a tabby cat and we love her because she’s so sweet and funny.She makes us laugh everyday.Her best friend is a rubber frog that she carries around in her mouth and slaps around.The frog can always be found in her pet bed in the morning. I’m so glad you’ve found something to help alleviate the problem. While your cat may just be slightly overweight now, being so preventative and trying to tackle the issue now will help in the long run. I always think of the stress on animals joints when they’re overweight and am so happy to see owners being proactive! 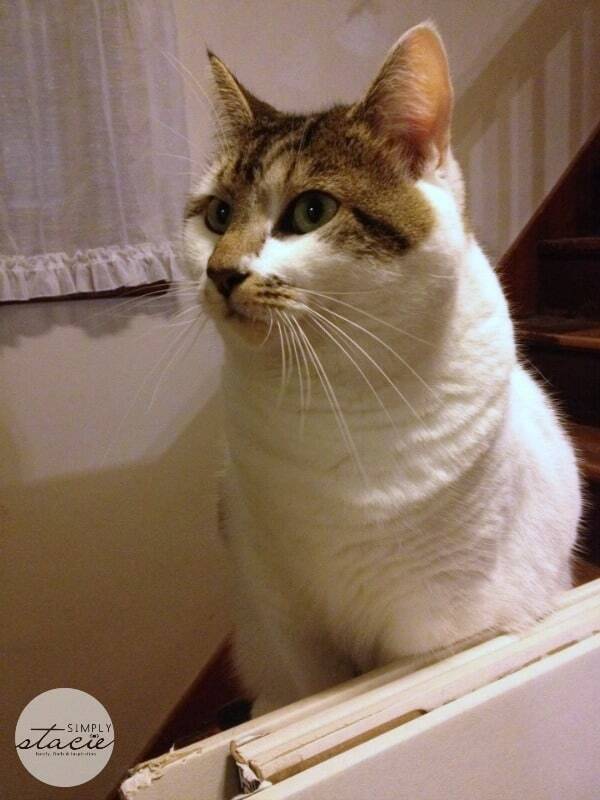 My sister has a cat that weighs 20 lbs. No joke! I’m forwarding her this post!